Now that I’ve dated myself, this picture brings a lot to mind. One, my husband has a traveling exhibit about Route 66. Another, my father traveled west on Route 66 as a teenager as his parents looked for work at the end of the depression. And last, I love Chicago. It is a place near and dear to my heart. It’s a toddling town. With that, I’m sticking with the theme of stealing song lyrics for this week’s entry. – I don’t care if you ever come back, Joan yelled as the tail lights faded away. She’d kicked him out one last time. This time, she told herself, it was for good. Postcards began arriving, town names from their past – Springfield, Joplin, Amarillo, Santa Fe, Flagstaff, Needles – places they had travelled before and had been happy. Memories taunted her, their promises, their history. She wasn’t taking him back. No way. – Come to Santa Monica. I’ll send you the fare. You know I love only you. Packing a bag, Joan knew. This time, things would be different. 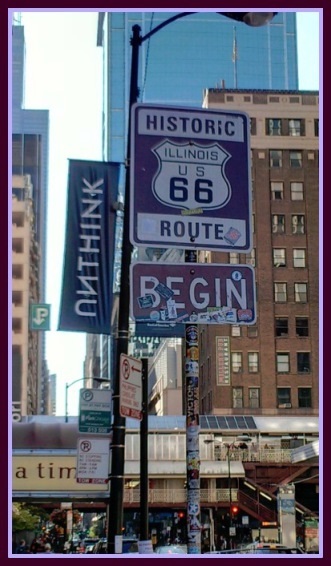 This entry was posted in Flash Friday Fiction and tagged love, route 66, trust, writing. Bookmark the permalink. Ah, yes, funny how quickly the good times erase the bad and cause us to make choices we shouldn’t. Fool me once…ah, poor Joan. She may never learn. No, Joan don’t do it! It’s a story, tried and true. You told it well, Erin. Sometimes your characters just do what they do. It’s like they don’t listen to me…. I like it! Nice shout-out to that husband and his exhibit. The eternal hope that things will be better, even when past experience has proven otherwise. Sigh. But what the heck is a toddlin’ town? I tried finding out via Google but to no avail. Oh yeah, another one of his lies. Oh wait! This time it will be different. (One can only hope). LOL I really enjoyed this story! Amnesia (or multiples) is the only reason any of us have more than one child. Love must. Well done! Isn’t that the truth? Nature relies on it! Well maybe it really will be different this time! ..,but it probably won’t. I like that you are willing to think it could! I had to look up the song to be sure of the lyrics. I’d forgotten who did it – and would never have come up with the name! Oh, dear. Joan is a pushover. Memories and longing for good times in the past exert a powerful pull, that’s true. Well told. Yes, sadly, Joan is. She will probably never learn! A truly perfect story. This time…. Loved it. The collect call was priceless. Thanks, Doug. I mean, there’s a type, right? Any more, the collect call is an archaic twist – but I wanted to punctuate the act. Glad you liked it! Nice to see you back filling the hole you leave in your absence. I fear for Joan. Will it really be different? Nicely done from the first line to the last. I don’t think it will be different. She’s a pushover. Thanks for the welcome and I am doing better so far this month! I remember a terrific song that ran along similar lines. The optimism of the person left behind is always painful to record. Nicely done. A good song lyric can help us forget almost anything. And all her bags are packed… now I’m humming. Ha! I should have included that one! Thanks for reading!